2014 BMW 5-Series Pros and Cons: Why (Not) This Car? Audi wants to be to diesel-powered luxury cars what Toyota has been to hybrids. If Ingolstadt's marketing offensive succeeds, people won't even think of other makes when considering a diesel-powered luxury car. BMW has decided to mount a serious challenge before it's too late. In 2013 Americans and Canadians could buy only one BMW model with a diesel engine, the X5 SUV. For 2014, BMW added diesel options to the 3-Series and 5-Series sedans. For 2015, they're adding diesel versions of the 7-Series sedan and X3 SUV. The 3-Series and X3 use a 180-horsepower 2.0-liter four-cylinder diesel that lacks refinement and responsiveness given the sport sedan mission of the former, but that could be a better fit in the latter. The larger BMWs use the company's 3.0-liter six-cylinder diesel engine. Though BMW's arsenal includes a 375-horsepower three-turbo variant of this engine, we're getting the single-turbo configuration, which peaks at a mere 255. With this efficiency-oriented engine, can BMW thwart Audi's quest for diesel hegemony? I spent a week with the 535d midsize sedan to find out. Black leather plus aluminum trim. Because you're a very serious driver. 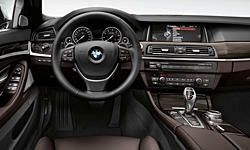 Why the 2014 BMW 5-Series? The BMW 535d isn't the class's fuel economy champ. That title goes to the Mercedes-Benz E250 BlueTEC, with EPA ratings of 28 mpg in the city and 42 mpg on the highway (27/38 with AWD). But, considering that the BMW's engine has two more cylinders (for a total of six) and 60 more horsepower, it comes surprisingly close: 26/38 with rear-wheel-drive (as tested) and 26/37 with all-wheel-drive. Audi's similarly sized 3.0-liter turbocharged diesel, though 15 horses less powerful than BMW's, is less efficient in "city" driving, with EPA ratings of 24/38 (with mandatory AWD). In the real-world, the trip computer reports suggested an even larger BMW advantage, especially at lower speeds. My suburban averages with the 535d ranged from 34.6 to 47.2, with high 30s fairly easily achievable (if I avoided the temptation to bury the go-pedal). The Audi's suburban averages were stuck in the mid-30s, with a high (in fewer attempts) of 38.4. On the highway, the Audi managed a coupe mpg over 40 where the speed limit was 60, and a couple under 40 where the speed limit was 70. The rear-wheel-drive BMW virtually tied the all-wheel-drive Audi at high speeds, but achieved 53.8 mpg on one 65-mph freeway trip. This is incredible (yes, I'm wondering about the accuracy of the trip computer myself) for a sedan with the 535d's mass and performance. As with other BMW's, selecting the "eco pro" mode can substantially improve fuel efficiency. Engage this mode, and it becomes easy to drive a powerful BMW like a hypermiler would a Prius. Audi and Mercedes-Benz do not offer a similar mode. I did not care for the BMW 328d. 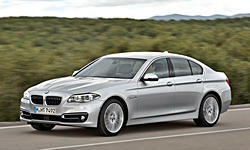 Its 180-horsepower 2.0-liter diesel lacks the refinement, responsiveness, and performance expected in a 3-Series. The 535d's 255-horsepower 3.0-liter diesel much better upholds the brand's reputation. This six isn't as quiet or as refined as Audi's. You'll feel some vibration when idling, and hear some grumbling both then and when casually accelerating at around-town speeds. But Mercedes-Benz's four (and its six as well, for that matter) is even less successful at concealing its identity. BMW's compression ignition six is plenty well behaved unless your tolerance for diesel clatter is near zero. The BMW engine compensates for its slight lapses in etiquette by out-performing the Audi V6. It might be the least powerful diesel six in BMW's bin, but the 535d feels stronger than the A7 TDI I also reviewed recently. Push the accelerator most of the way to the floor, and you'll receive a healthy shove in your lower back as the needle shoots up the dial. In instrumented testing elsewhere, the 535d got from a roll to 60 in 6.3 seconds, very quick by just about any standards and over a half-second sooner than the A7 TDI. Beyond the numbers, the BMW engine revs more willingly than other diesels, and in the process has the invigorating sound and feel expected from a Bavarian motor. The six can wind as high as 5,400 rpm, 600 above the Audi's limit. Also 1,400 rpm above the power peak, so there's little point in venturing so high--except that this diesel does it so willingly and other diesels can't. While the BMW engine is more of a revver than other diesels, like other diesels it most excels in torque output at low to moderate engine speeds. Need to merge in fast-moving traffic? A dab of throttle will do ya. In typical daily driving, the six moves the heavy sedan effortlessly. The same is true of Mercedes-Benz's four. But run flat-out it can't nearly match the pace of BMW's and Audi's sixes. A bit of a learning curve, but controls logically arranged and close at hand. Audis, even the fastback A7, remain exemplars of tastefully understated styling. Though past BMWs similarly worshipped at the temple of Bauhaus, for the past decade they've taken the road more traveled. The exterior of the 2004 5-Series incorporated more than a few controversial elements. The 2011 redesign returned the sedan to the vicinity of its form-follows-function roots with more smoothly flowing lines, but the new car's surfacing was, if anything, even more dramatic. The current 5 is larger than its ancestors, and its deeply (if smoothly) sculpted bodysides amplify this growth. Though, like other BMW's, the 5er's nose has grown (to comply with European pedestrian safety standards), its proportions remain athletic in a way that an Audi, with its engine largely ahead of its front axle, can only dream of. Especially when dressed in the M Sport Line's more aggressive body bits and 19-inch wheels, the 535d visually dominates the road. Too much? For some people, perhaps. They'll buy Audis. But those who believe that more is more will prefer the BMW. Note: rating actually against the A6, which is the sedan form of the A7. Can the BMW 535d deliver on the promises made by its styling, and actually dominate the road? Too much so, perhaps. In casual driving the 535d feels massive, even unwieldy, as the M Sport Line's 19-inch run-flat tires seek to pound every bump back into the pavement and the heavy steering (in any mode) resists rotation. This is largely a matter of tuning. The Audi A7 TDI, with its standard all-wheel-drive, weighs more but doesn't feel nearly as massive. The heavy steering is a change from the last 5-Series I tested. BMW might have reacted to criticism that the 2011-2013 car's steering felt overly light by making it overly heavy. When driving the revised 2014 car, "Musclebound" frequently popped into my mind. Hustle through some curves, though, and the chassis delivers the balance, poise, and precision for which BMWs have been known. The pounds and inches seem to shrink away, the chassis drawing within screaming distance of agile. The car seems much happier. You feel much happier. So, how often will you really push it? If and when you do drive the 535d con brio, you'll want to dial back the stability control system. Left in its default setting, the system cuts in early and hard. Switch over to Sport+ mode, and you can rotate the car's rear end nicely with the throttle. You can't do this in the Audi diesels. Their standard all-wheel-drive systems have a fixed 40/60 torque split, and their chassis tuning prioritizes absolute stability over lively handling. This difference more than any other is why I've listed handling among the "why to buys" for the 535d despite my mixed impressions. Note that the tested car had the M Sport Line package, which includes a sport suspension and low-profile tires, 245/40YR19s up front and wider 275/35YR19s in back. The car might be more livable, if less capable, with the standard suspension and 245/45VR18 tires. Performance options not on the tested car include $1,750 active steering (which varies more in quickness and effort, and which also includes rear-wheel steering) and a $3,500 Dynamic Handling Package (which includes active stabilizer bars to reduce lean in turns and adaptive dampers to vary suspension firmness). In my experience with other BMWs neither option had a clear benefit, which might explain why they weren't on the car BMW provides for testing. Those in need of maximum grip will want one non-factory option: higher-performance tires. The Primacy HPs BMW fits as the "performance" option were plenty sticky for any driving I was able to do in suburban Detroit. But these are the same tire model that some people have found insufficiently grippy on the Scion FR-S and Subaru BRZ sports cars. Which one of these is not like the others? Oddly, a car set up for aggressive driving also has the largest trunk in its class by a significant margin. The 535d sedan's 18.4-cubic-foot trunk tops the Mercedes-Benz's by two and the Audi's by over four. If you need a sedan that can haul in more ways than one, you've found your car. Just avoid getting a flat tire. The BMW's large trunk is enabled by the car's lack of a spare. The tires are run-flats, so they can be driven for a little while with no air in them. The downside: they don't ride as well as conventional tires even when they do have air in them. Why Not the 2014 BMW 5-Series? No surprise here--price is the top reason not to buy a BMW 535d. Adding even the handful of options on the tested car bumps the list price (for the 2015) from $57,800 to $66,700. It's possible to take this price much higher. Adding all-wheel-drive, to match the A6 TDI, takes it to $69,000. The Audi's price when similarly configured is a substantial $6,225 lower. The BMW's additional content, including its additional seat adjustments, account for about $1,600 of this difference. The 535d is similarly more expensive than the Mercedes-Benz E250 BlueTEC, but in this case it at least has additional performance to help justify the difference. In each of these comparisons I've equipped the cars with LED headlights, as these were on the tested car. But is slightly better lighting worth another $1,400 to $1,900? As noted when discussing how the 535d handles, the BMW rides firmly, at least in M Sport Line form (opting for different suspension and tire options could help). The low-profile run-flat Michelin Primacy HP tires feel stiff and massive as they pound across bumps and divots. This said, the car's ride rarely feels jittery, much less harsh. The tire impacts sound worse than they feel. The "double kidney" grilles keep getting wider and wider. Auto-dimming LED headlights are $1,900. If you want a coldly technical, driver-oriented interior, you'll find one inside the BMW 535d. For a somewhat warmer ambiance, mocha leather would be a better option than the tested car's black nappa hides. But an Audi interior is more cleanly styled and more visually relaxing, while a Mercedes interior is glitzier (for people with more traditional luxury tastes). I'm usually a big fan of BMW's highly adjustable, well-bolstered yet cushy (by German standards) "multicontour" seats. The firmer, flatter buckets in Audis simply don't compare, and Mercedes seats aren't quite as form-fitting. I didn't enjoy BMW's best as much this time around, though. In particular, the headrest seemed too far forward even in its least far forward setting. Maybe the issue was with me. My neck and back felt a little stiffer than usual, quite possibly for reasons having nothing to do with the car. In a different week, or with a different back (yours?) they could still be among the best seats available. BMW's six-cylinder diesel out-matches Audi's at the things diesels do best. It feels very strong in typical around-driving. And it can return outstanding fuel economy. I have more qualms about the rest of the 535d. The styling, features, and performance all impress. Emphatically. It's impossible to escape the impression that there's a lot of car here. If someone inside BMW ever tells an engineer "no," they don't do it often. But often in my driving the 535d felt like too much car, and even out of its element. Sometimes on the way to get my son from school I just wanted to relax, but (at least in M Sport form) the 535d cannot relax. It's a sledehammer whether you need one or not. On the other hand, if and when you do need a sledgehammer, the 535d will vanquish the road as well as the gas-powered 535i, only using far fewer gallons of fuel in the process. Intake tube blocks removal of thick piece of foam, so only half of the inline six us visible here. Largest trunk in a midsize luxury sedan. BMW and Audi each provided an insured car for a week with a tank of diesel. 2014 BMW 5-Series pros and cons, according to Michael Karesh: the best reasons for buying (or not buying) the 2014 BMW 5-Series. Join TrueDelta to post your own impressions. and pleasant sounds. I didn't care for the 6 cylinder diesel; too noisy, crude, sluggish. encephalopathy to try to pawn off that those wretched 4 cylinders on those of us who had grown up with the BMW 6 cylinder engines. There's a place in hell reserved for those who debase a formerly heavenly engine line. I suppose kuru might explain it. The diesel 6 is at least smoother than the diesel 4, and is about as BMWish as diesels available here get.